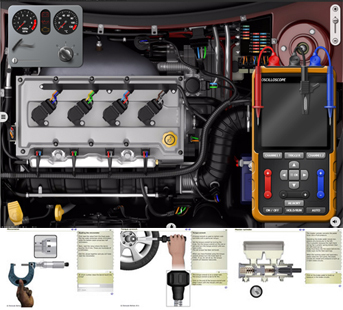 Electude is a simulation-based e-learning automotive training solution. It allows students to learn about the complete vehicle, from bumper to bumper, and teaches them how to maintain and repair cars with interactive animations and simulations. The content in Electude appears in modules. A module can contain a theory lesson but it could also include an educational computer simulation, a test, an interesting link or even a task sheet which you have developed. In short, modules contain all of the elements which make up part of the curriculum. Multiple modules grouped together for a teaching objective are called a course. Electude has been created with the perspective that teachers, lecturers and trainers should be able to make their own courses. For this they have at their disposal the hundreds of "ready-made" Electude modules which can compliment their own material or that of colleagues. These can easily be added to Electude. The Simulator modules are part of the engine management simulator of Electude. It is an application which visually simulates the behavior of a engine management system through the use of highly accurate algorithms. With the aid of an oscilloscope, multimeter and other tools, a user can carry out countless actions in this virtual engine management system. Quite simply, a user can do everything they could do on a real engine. This Simulator is equipped with same sample student tasks which have been added as modules. These tasks are related to fault finding. Instructors are able to create thousands of fault-finding combinations by assigning the faults, making descriptions and even determining which tools can be used. These can vary enormously from Level 1, a wet spark plug or an empty tank, to Level 2 where, through the various fault codes, a defective sensor or actuator needs to be found. A Level 4 example is when an erroneous fault code points to the wrong component and the student must think through the problem logically to discover the real solution.